I thought the best way to approach this word, goodness, was to first look it up in the dictionary. The definition given for goodness is the state or quality of kindness, generosity and excellence of character. It also says that goodness is the essence or most valuable part of something and it is a euphemism for God. This helped my focus, as the Bible speaks of goodness as a quality that God desires for his children. It is one of the fruits of the Spirit mentioned in Galatians 5:22. Goodness is a result of being with God, being indwelt by God and knowing Jesus as our Savior. In Genesis, God proclaims His creation as being good after each day, Genesis 1. When God created man He said it was very good. Genesis 1:31. Before sin entered the world, all of creation was good in God’s eyes. After the fall of man into sin, the world was permeated and clouded by sin. The purity and goodness of man was gone and God alone was good. God is good and scripture encourages us that looking to God we will see goodness. Psalm 34:8 “Taste and see that the LORD is good; blessed is the man who take refuge in him.“ Psalm 100:5 For the LORD is good and his love endures forever; his faithfulness continues through all generation’s.” Nahum 1:7 “God is good, a refuge in times of trouble. He cares for those who trust in him.” Goodness is part if God’s character. He desires that we have this character trait too. Scripture tell us that since man is sinful, he is not good. Psalm 53:3b “there is no one who does good- not even one.” Mark 10:18 and Luke 18:19 “Why do you call me good? Jesus answered, ” No one is good- except God alone.” Romans 3:12 “All have turned away, they have together become worthless; there is on one who does good, not even one.” So how are we to attain this character quality that God desires for us? In Christ alone do we find the power to behave with goodness and reflect the quality of goodness in our lives. Ephesians 2:10 “For we are God’s workmanship created in Christ Jesus to do good works, which God prepared in advance for us to do.” 2 Corinthians 9:8 “And God is able to make all grace abound to you, so that in all things at all times, having all that you need you will abound in every good work.” Philippians 1:6 “being confident of this that he who began a good work in you will carry it on to completion until the day of Christ Jesus.” Tell us that the power of Christ in our lives will bear the fruit of goodness. 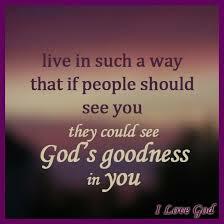 Look to Christ and depend upon Him each day to help you to walk with goodness and show others the goodness of Christ. Micah 1:8 reminds up “He has showed you, O man, what is good. And what does the LORD require of you? To act justly and to love mercy and to walk humbly with your God.” Endeavoring to live a life for Christ filled with His goodness pleases God! Is this your desire? Will you lay yourself before Him and ask His help and guidance to better reflect His goodness and mercy to others? God called me to account yesterday at CVS. I thought I would like to go to CVS at least one day during the week, hang around for an hour and approach someone who looked like they needed a friend. God caught me yesterday by an Hungarian woman who needed someone to listen–for about an hour. She is in her 80’s and needed to do some venting. It was good. I hope to see her again. I told her I would be praying for a Social Security Medicare appointment she will have tomorrow a.m. So, God said “it’s a deal. Let’s keep doing this.” 🙂 Maybe some will come to Crossroads if they don’t have a church home. Thanks for the nudge to work on goodness. That’s great, Sue! Thank you so much for sharing. Keep up the great work!